I have been writing this story since 2013. Now, that I have created a blog in the last several months, it will finally come forth. But, as I now struggle to size down the eleven pages I had typed and proofed ready to go into my book, The Yood of Elohim, I see more than before. Perhaps that is why God has held it back until 2015 to reveal this. I believe we will see even more proof that God is active in our lives and perhaps these are harbingers to show us the future. Iyyar 4 and 6 2015 are jumping off the pages as I type. May you be amazed as I have been. Israel’s Independence Day is a prophetic day that was foretold to all the fore fathers. This prophecy has commenced in our life time. It is still unfolding as we breathe. The first thing to resolve is to why Israel’s Independence Day moves around. Was it 5 Iyyar or 6 or ???? It was May 14, 1948 – Iyar 5. Yom Ha’atzmaut is celebrated on the 5th day of Iyar (ה‘ באייר) in the Hebrew calendar, the anniversary of the day on which Israeli independence was proclaimed, when David Ben-Gurion publicly read the Israeli Declaration of Independence. The corresponding Gregorian date was 14 May 1948. If the 5th of Iyar falls on a Friday or Saturday, the celebrations are moved up to the preceding Thursday. This rule has been effective since 1951. If the 5th of Iyar is on a Monday, the festival is postponed to Tuesday. This rule has been effective since 2004, in order to avoid potential violation of Sabbath laws by preparing for Yom Hazikaron or Yom Ha’atzmaut on a Shabbat. So, there we have it. Israel in 1951 was concerned about having a celebration that caused lots of work for it’s people when they knew they were instructed to rest on the Sabbath as God had rested. They know they are to be representative of the Creator and act as He acts. He rested and so they rest. It could remain as simple as that. But since God had already witnessed the disobedience right from the start with Adom’s kids, He reminds them of this rest and even put it in their “instruction book” known as the Torah. He did not change the fact that they were to still repeat the ‘stories’ of His hand on them, and He also had Mosche write it down for ALL generations to follow. It was the first instruction… never to be violated. It was God’s time with them and their time with God and their families. I begin with these thoughts because God started with these as His first thoughts as we see in the very first chapters of Genesis. God said that everything that He instructed to come into being was good and the seventh day (Sabbath) REST was good. I’m not sure why men object to resting. It’s a good instruction. If they violate the first instruction, is it likened to violating all of the rest? Do we pick and choose which ones we like to do? I could say that this is another topic for another time…but it is NOT. The earthquakes, oil anointings, eclipses, etc. are all connected to this rest. It does go back to the scriptures that constantly tell us that obeying God brings us peace in our lives. As a past Catholic and Baptist I know all the reasons and arguments for not adhering to the Old Testament…. thinking that Christ did away (fulfilled) these unnecessary rules and regulations. Yes, Yeshua is the ‘completeness’ of them. My seven-year bible study on this topic shows me that these were not done away but men’s traditions removed them for various reasons. It has been an entire Shemittah cycle (7 years) and I have been sifted by friends and family over this topic. In my sifting, I have found myself only purged into a vessel that has been strengthened in this finding. You will have to decide what brings safety to you. Since 2013 and looking at the bible from a Hebrew calendar, I am more than convinced of God’s hand on this world. I also am convinced that there are ‘special’ times that He has set aside and there are ‘special’ times that the Hebrews and Jews have set aside to be sorry for their sins and the sins of their fathers. I have come to believe that God has changed some FASTS into good days; and now even in these findings I am witnessing some of the Hebrew’s days of prophecy being fulfilled being recognized by God. Yes, even their self-imposed ‘fast days’ are turning into good days. That is what we want to see, God’s promises of this coming true. Men seem to be watching for all of the dooms of the world, but what gives God glory is when we see Him active in the lives of men. Men do NOT understand the ways of God. The ways of God are only seen through ‘spiritual’ eyes. It is Abraham that he was a stranger on this earth. Yeshua said He had no place for His head to lie. Abraham gave of himself to raise up a family that would go into generations….numbered as the stars. God’s promises are eternal. Are we leaving an inheritance to our children that is spiritual? Let’s ask the question, “What is a good day?” You may have a different opinion than God. Next, we should be asking ourselves, “What ‘fasts’ are changing?” As we review when God’s hand acts, we will see the course He takes and when. I am going to submit to you that God listens to His children that talk to Him; many call it, prayer. God’s hand will be simple to see when you get yourselves on the right calendar. Who is talking to God, when are they talking and what are they talking about? And yet, we do get to see God working on the Gregorian calendar as well… so every man can see His hand and be ‘without’ excuse. I keep telling people that there is nothing different about my ‘insight’ to God except TIME and the CALENDAR. If God’s children would be on His calendar, they would see when He repeats things in history. The children need to take the TIME to do this. What better day than when RESTING! Hmm! So, back to the question of “What day was Israel’s Independence Day?” In this conversation we have put God, ‘in a box.’ It is a very small 24-hour box. I hear myself telling others not to do that and then I do it in this example. In this little 24-hour window of a box, He is very explosive. We could widen His box but then some will say, “Well, that is just a co-incidence.” People say that every day is ‘set-apart’ to the Lord. That also is not true. He cares about every day, but every day is not ‘set-apart’. If every day is ‘set apart’ then there is no room for a ‘set apart’ day. Does that make sense? Every day can NOT be set apart or nothing can be ‘set apart.’ This thinking has turned everything to being ‘common.’ Common is what is ‘normal.’ Something ‘common’ is not special. Sorry, to linger on this…but God moves when He desires to move in men’s lives. There is no doubt that He moves every day in men’s lives. But, on a larger global scale, we will see Him moving to set up a pattern for us to see. This is where I don’t put God in a box because He can move and do whatever He chooses and goes ‘outside’ our box. We should not be disturbed or doubting our Creator as His purposes will be fulfilled. Once you see God in the ‘little time-frame,’ perhaps you will be able to see Him in the bigger frames of life. We can shrink time-frames into minutes and hours. And, guess what? God is still there! This morning, as I awoke thinking about how to set this story and my other findings on a course that you can understand, God reminded me of His first objective for us. I started out with the yhebrew.com blog as a weekly Torah study. He is going to bring us back to that. From here out I’m going to put the occurrences in perspective to what the Torah readings are for the week in which they occur. He also reminded me that His box gets bigger at times as He moves within that 7-day week as we just saw him at Israel’s Memorial and Independence days. Our Creator, Adonai, also works within a time period of seasons. My goal was to observe God’s Hand in His months to see if there was a theme. The answer is, “Yes.” There are themes and we will see that. It has been my examination that God does operate ‘circular’. The Hebrew alphabet is known as the Aleph to Tav. Each letter is a letter, number and symbol. There is no end to it as it just begins again. A is the letter Aleph which represents God. Tav is the sign for God. Tav is the sign of the covenant with God. It looks like a small t. Do you see it? Yes, it’s a cross. To the Jew this (cross) is offensive as thousands were killed on them during the time of Romans. But sign (tav) means covenant. He made a covenant through that stake which brings us to God Himself. Now, who was that one on the stake that was the ‘first’ to defeat death? Hmm…He is the connector…He is Messiah Yeshua raised on Nisan 17, the first fruit and unleavened bread. He defeated death being the first one to rise because He had no sin (leaven) in Him. The Aleph to Tav is all encompassing of God and what He is. It is likened to the first five books of the bible known as, The Torah. When we study the last book of The Torah, Deuteronomy, and it’s last chapter; there is a connective reading that brings us back to the beginning, Genesis 1. The last book connects to the first book. Our lives in God are never to have a stop or end. We choose God, through Messiah Yeshua and live under His care through Torah (all instructions in the Bible). Now we see why Israel will push their 5 Iyyar celebration back and forth…. to adjust for the Sabbath of rest. This rest signals their trust in God to give them rest from their enemies on ALL days. May 15, 1948 was the deadline set that ended the Balfour Declaration that was signed November 2, 1917. It was eight hours before the agreement expired. The land mass that had been originally designated for the Jews had shrank drastically. The papers were still signed and President Harry S Truman was the first witness..country who recognized Palestine/Israel as a nation. Arab planes flew overhead within hours striking the new nation. The Deepwater Horizon Rig was set at Macondo January 30, 2010. It was Shevat 15. EIGHTY days later: April 20, 2010, 6 Iyyar, Israel’s Independence Day it would blow spewing 50,574 barrels daily. It was $40 Billion clean up. President Obama sued for America. Britain, Russia and other countries sued since they had to halt production. At seven days (a Shemittah week) the oil was 100 miles wide and 20 miles from Louisiana. The slick would cover 1600 miles of beaches. Fire set to burn off oil: April 28, 2010, Spills ‘Eighth Day’, 14 Iyyar, Pesach Shini (burnt offering), 29th Day Counting Omer. Burnt Offering: Pesach Shini – Occurs every year on 14 Iyar, exactly thirty days after 14 Nisan, the day before Passover. If anyone was unclean from touching a dead person or other issues, and they were not able to participate in Passover, they could bring their Korban Pesach (“Paschal Lamb”) on 14 Iyar, the next month. Korban means, ‘Offering to God’. There were five other offerings but only ONE burnt offering. The burnt offering could be taken into the ‘veil’ where Adonai was, and it was on Yom Kippur, Tishrei 10, the Day of Atonement. This day is known as face-to-face and The Fast. It is the only FAST requested from Adonai. When did this oil stop it’s flow? It was on Yom Kippur…Tishrei 10, 11. Amazing. It begins at the Four Horsemen prepared to be released to take peace from the earth, Shevat 24. It begins on Israel’s Independence Day that was foretold since Abraham. CEO, Tony Hayward takes fourth place in his class in a yacht race in ‘Isle of Wight.’ It is bad publicity as he is 4500 miles from his oil spill that will leak 4.9 million barrels of crude in the fourth month, 4.20.10. $40 Billion is reserved for damages. The Fast of Av (Abib 9) known as Tisha B’Av is the most serious of fast days for Jews since their Temple was destroyed both times on this day and many more troubles. Shabbot Hazon (Isaiah 1:1) preceding Tisha B’Av and Nahamu (Isaiah 40:1) followed the 9th of Av. What day was Tony Hayward BP CEO replaced? Simchat Torah, Tishrei 23. The Fast of Tabernacles is ended but they stay one more day. It is for those outside of Israel that would like to rejoice in the Torah. Thus is called, Simchat Torah, rejoicing in the Torah. Tony lost his tabernacle of wealth from the black anointing oil. It was his management of supplying poor quality valves that caused the FIRE, death of 11 people, loss of animal life and years to replenish the earth. I look at this disaster as a ‘harbinger’ as to what is to come. Each of these feasts and fasts were noted by God. Sabbath Shirah (Sabbath of song included with Beshalach) Song of the sea (Ex 15-18) by the children after the passage of the Reed Sea. Includes Song of Deborah. Interestingly appropriate for the Gulf’s soon-burning waters. Sept 19, 2010 11 Tishrei, Yom Kipper Day 2, The Fast * Leak is sealed – Day 152, Shabbat Bereshit (“Sabbath of the beginning”) commences with Genesis 1. The well was sealed and now a new beginning. Remember, God lead them by cloud during day. 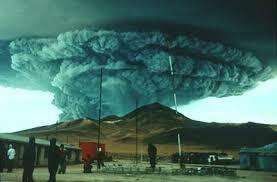 The first day eruption was a cloud of ASH. The second day the eruption was bright burning fire with lightening in it. And, God lead them by FIRE at night. They were never without light. What day was 6 Iyyar in 2010. It was the New Horizon Macondo BP oil spill in the Gulf of Mexico. It was Israel’s Independence Day. It had fire that shot into the air and within 36 hours the rig sank. Eleven people died, 17 injured and 115 were evacuated. What day was 6 Iyyar in 2015. Nepal India hosted two quakes 7.8, 6.6 earthquakes. It was the Sabbath day of rest, April 25, that God restored to Himself 4,000 people at the top tourist attraction of Mt. Everest and area. The Torah readings were “after the death” and the second reading of ‘holy.’ Leviticus 16:1-20:27, Amos 9:7-15 can give us more insight to that day. ‘After the death’ of Nadab and Abihu, because of their ‘false fire’ (worship), their burnt carcasses were taken outside the camp as an example to Israel. God removes what is not ‘set apart’ to him. Holy does not mean ‘righteous’ but something ‘set apart’ for a specific purpose. God used Nepal as a ‘holy/set apart’ example of men’s pride in false worship and Mt Everest as a mountain of ‘pride’ on His earth. Nepal has over 300,000 people pouring of that area as God continues ‘setting it apart’ through shakings and storms. 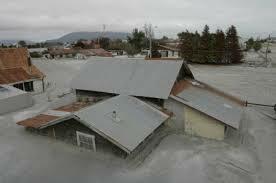 Chileans are leaving their homes as the glass-like ash has made their homes uninhabitable. Here is a recap of God’s Hand for this last week. To begin with memorializing IsraEL’s dead is very appropriate. They have had too many deaths in their history. ISRAEL’S MEMORIAL DAY, Yom HaZikaron, 18 Day Counting Omer, April 22, 2015, 3 Iyyar 6.3 earthquake Solomon Island, Chili first volcano blast with 40,000 ft high ash. Flights closed as ash travels to Argentina. No one killed. ISRAEL’S INDEPENDENCE DAY, HaAtzmaut, 19 Day Counting Omer. April 23, 2015, 4 Iyyar, Chili Volcano second eruption. 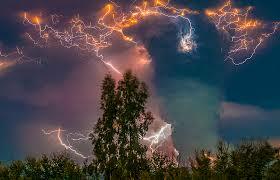 Views of FIRE and horizontal and vertical lightening are incredible in the day light and in the dark. 4 Iyyar, dark, no moon. This is about the removal of Nadab and Abihu by fire as they brought the wrong anointing oil in the wrong pans on the wrong day. Whoa …do we think God is interested in correct worship? I think so. It’s about oil and fire. Then, the extra reading was about being ‘holy’ and how the Sabbath sets men apart from the world. Whoa again. The 7.8, 6.6 earthquake killing over 4000 was on the Sabbath, Teaching about the Sabbath. 4000 are now rested. The extra Torah reading would have been read in the extra month, known as Adar I, if an extra month (29 days) had been added to the Hebrew calendar in 2015. It was not added and therefore it fit perfectly with the Nepal message from God of, ‘after the death’ and ‘holy.’ We are to be ‘set apart’ ‘holy’ to God before our physical death so we can be, ‘after our death’ for eternity. Mount Everest speaks well of it’s name. It should be ‘Forever’ known as being ‘set apart’ to God for it’s purpose of drawing men to REST, The Sabbath. Nepal, India/China with a third earthquake (6.7) on Sunday. Only after the death to ourselves can we be ‘holy’ as God is holy. God wants us ‘set apart’ to Himself. These mountains explode with volcanic fire, lightening, and shakings are likened to God speaking to the Israelites as he was giving them instructions in the desert. They said they would do all that God said…but they did NOT even have the confidence to go in and secure the land God had readied for them. Their mountain experience soon left them and fear set in of the ‘giants’ of the earth stood before them. These are the stories that we MUST remember for them and tell them to RETURN to their land. It is their land of inheritance. God is going to continue to shake the land in which they live to scare them back home. He told Mosche that he appeared to them in thunderings and lightnings to get them to fear God and have respect for His instructions. They got use to God living with them and we are use to putting God in ‘our’ little box as we see Him. Today, we saw God shake the earth on the Sabbath that taught about the Sabbath. He shook the earth on IsraEL’s calendar 6 Iyar, Independence but bombs dropped that day killing them. Vengeance is mine says Adonai. 1948 5 Iyyar, Israel’s Independence Day 1948, Bombs dropped on them in the next hours. 2010 6 Iyyar BP Gulf Oil Spill – Black oil anointing – sinks in 36 hours, continues 152 days. 2015 5 and 6 Iyyar, Two Chili Volcanoes Ash Plume 6 miles high on Wednesday. Second eruption Fire with lightening Thursday. Incredible photos. 36 4.5+ quakes in the world that day! People flee as glass ash covers land and air. 2015 6 Iyyar, 7.8, 6.6 Nepal, Mt. Everest earthquake, quakes/rain continue. 4000 – 10,000 dead? 300,000 + flee Appalachian high mountains known as greatest tourist spot in world. But what happened the day before the Everest earthquake? 2015 Friday, 5 Iyyar, Iran confiscated cargo carrier in Straits of Hormuz. Iran fired shots, entered the ship directing it into Iranian waters. A US carrier 60 miles away heard their distress call. This was the second episode of Iran intimidating a cargo ship. Eve of Shabbat, Iran actually boarded this carrier. Is Iran tired of embargoes against them and in dire need of supplies for their livelihood? Has Iran turned to piracy? Or, was the owner of the ship in violation of a rule or perhaps owe fees to Iran for the use of it’s waters? There can be another side to this story…. The eleven pages I wrote of the 2010 BP Gulf Spill needs my review. The information is incredible. I will work on it and submit the information. It is God’s information and you need to see the story line. But, as you wait…think about this………. We always seem to have the problem of not having enough oil. Mary Magdalene anointed Yeshua with it before his death and burial and she was reprimanded for wasting it. The anointing oil for a burial is very expensive. Essential oils come in small dark bottles so as to keep them pure. The word Christo is used for Christ in the English language to explain, The Anointed One. In Hebrew, the word ‘Messiah’ means, The Anointed One. Jesus in Hebrew is Yeshua, meaning salvation. The correct Hebrew wording for Jesus Christ would be Messiah Yeshua or Yeshua The Messiah or Meschiach. I say all of this because this story is about Israel and her anointed Messiah that the world is looking to return. A new ‘OIL’ has been found. CO2 mixed with water is creating ‘fuel’. Wow…doesn’t this remind you of the scriptures that tell us that wheat will be sold for pennies…. I need to find those verses. It is telling us that what we count as valuable may not be valuable at all one day. We now are witness to “black oil” sitting in the barges around the world. This has been created because the Arab kings of the earth that would not stop production during their disgust with ISIS, IRAN and RUSSIA…. Now, those barges could be used as ‘terrorist’ threats. Will the terrorists light them afire? Will one-third of our waters be drenched in oil and put afire in clean up? This burning will cause the sun to not to be felt affecting our lives and plant growth? Our anointing must be in the Ruach HaChodesh (Holy Spirit). When will the fire come? God has given us a clue, but i am not a prophetess. But, it is time to share the rest of God’s story line……. What will stop the FIRES? When will you RETURN to Torah? Update: Israel sent a team of 260 members, the largest field hospital of its kind, to Nepal. Medical personnel: 127, Doctors: 40. This takes money but they treat people as if they were their own. One life is worth every effort and cost. Thank you for obeying Torah!